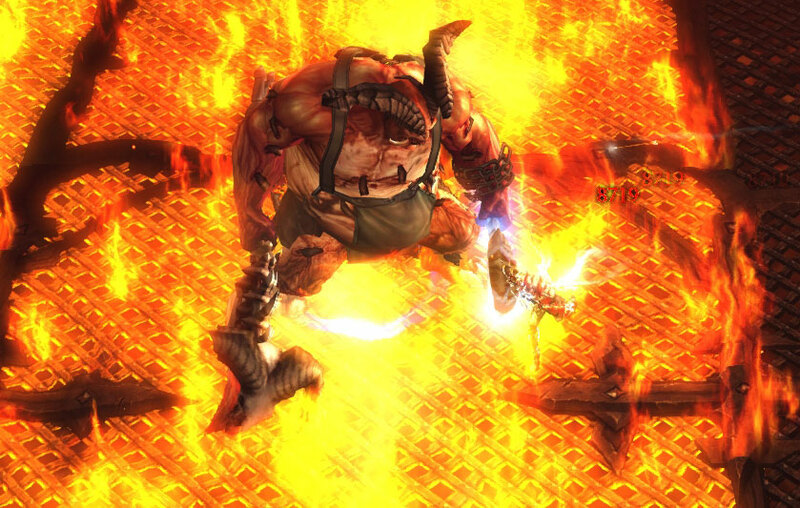 In honor of Diablo III’s birthday, I decided that I wanted to create a very special dish for the Lord of Terror. We all know Diablo as the “Prime Evil”, but do you know what else is prime? PRIME RIB, OF COURSE! You’re so much cuter in person! 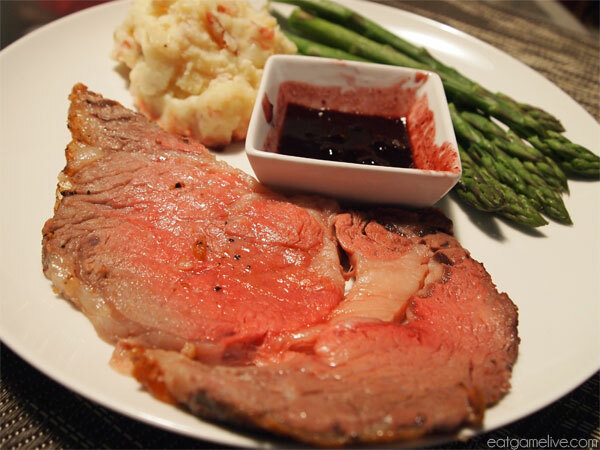 For this prime rib, I decided to try something different with the sauce, so I opted for a sweeter sauce that uses port wine as a base. Aww yissss. If you want a more traditional sauce, I recommend going for the tried-and-true aus jus sauce. Cooking a standing rib roast sounds like it might be a Torment IV-level culinary challenge, but it’s actually pretty simple. It just takes some patience, some prep work, and some good technology! Note: I highly recommend using a probe thermometer for this recipe! I have this one. 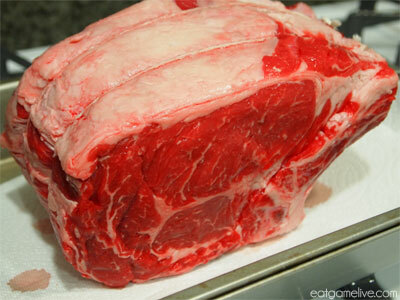 Allow the rib roast to come up to room temperature for about 3-4 hours prior to cooking. Prep time for this dish will take about 1 hour. Total cook time for the roast can range from 1hr – 2hrs. Cook time for the sides is about 40 minutes. This dish will make about 3-4 servings. If you would like to roast a larger rib roast, it’ll roughly be about 1 rib for 2 people (1 rib is roughly 2lbs). A rough estimate for total cooking time is roughly about 15 – 18 minutes per pound, HOWEVER, use a meat thermometer as your guide for when you should remove the roast from the oven. Once the roast has hit it’s target temperature (view the “Level of Doneness” chart above), you should take it out of the oven. I recommend purchasing your rib roast ahead of time so you can dry-age it in your refrigerator (set your temp to about 40°F). Dry-aging the meat will get rid of excess moisture and will intensify the flavor of the meat — basically your meat will be more meaty. The Butcher recommends that you dry-age your meat when you can! 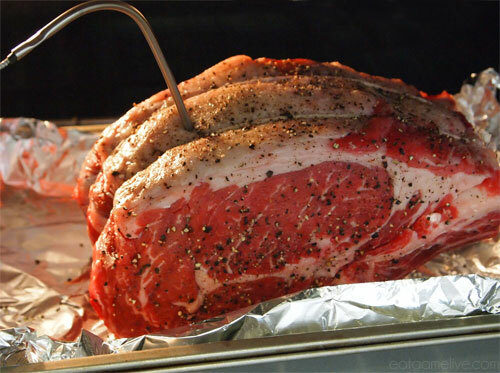 To dry-age your rib roast, place your rib roast on a cooling rack in a baking dish. 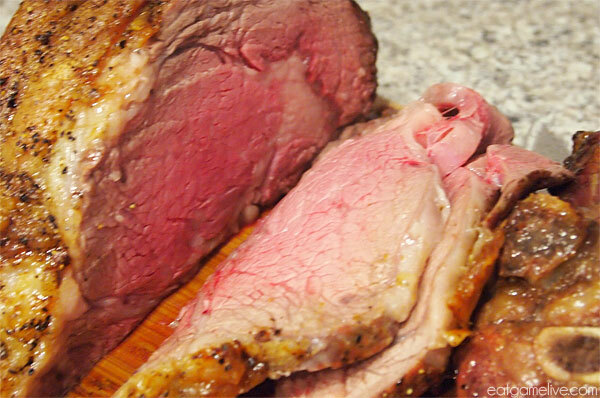 Wrap your rib roast in paper towels (or cheese cloth) and place your rib roast in the fridge. Change the towels every 24 hours. You can dry-age your rib roast for a week in your fridge (you may need to trim away the uber-dry parts of the rib roast). I kind of waited until the last minute to pick up my rib roast, so mine only had about 3 days of dry-aging. Pre-heat your oven to 500°F. Season your rib roast with salt and pepper. Rub your olive oil into the rib roast. Place the probe of your thermometer in the thickest part the meat (not touching the bone). Once your oven has come up to temperature, place your rib roast in the oven. Allow it cook for about 5 minutes at this temperature, and then immediately drop the temperature to 325°F. The high heat is used to build a crust on the roast. Place a head of garlic wrapped in foil in your oven (you can place this directly on the rack). The garlic will be used for your mashed potatoes. Allow the roast to cook until it reaches its desired level of doneness/target temperature (program your thermometer to beep at the desired temperature). While the rib roast is cooking, prepare your sides. Set a pot of water to boil. 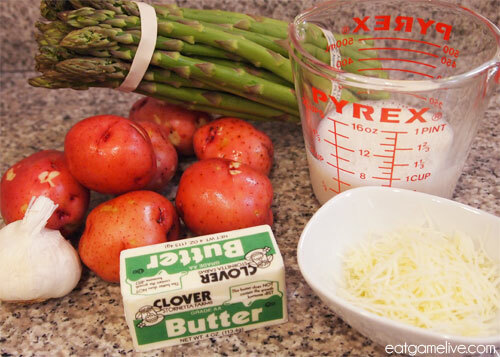 While the water is still cold, add in your chopped red potatoes. Season the water with salt. Allow the potatoes to boil for about 10 minutes, or until soft. Strain the potatoes and add the potatoes back to the pot. Add in your cheese, milk, and butter. 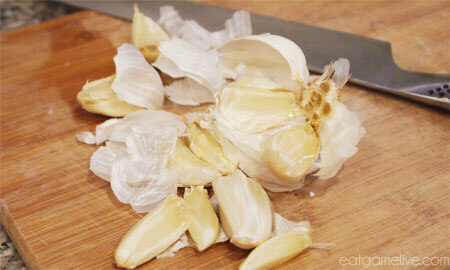 Remove your garlic from the oven and peel away the skin — be careful, because it will still be hot! Add in 3-5 roasted garlic cloves into your potatoes and mash to combine. Keep warm until the roast is ready to be served. Prepare your asparagus and gently steam them over hot water for about 6 minutes. Once the roast has reached the target temperature, remove it from the oven and place it on a separate plate. Allow the roast to rest for about 10 – 15 minutes. The roast will continue cooking while it’s resting. Strain the excess oil from the roasting pan and add the drippings into a sauce pan (if you didn’t use foil in your roasting pan, you can cook your sauce directly in the roasting pan over your stove). 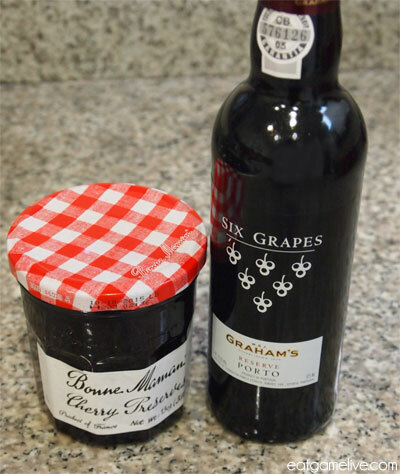 Heat your sauce pan on medium heat and add in your port wine. Add in your cherry preserves and stir until combined. Allow the sauce to reduce. Once the roast has finished resting, move it to a cutting board. Carefully cut the rib bones away from the roast (if you had your butcher pre-cut the bone away and tie it, this part will be super easy). Slice your roast into 1/2 inch pieces. 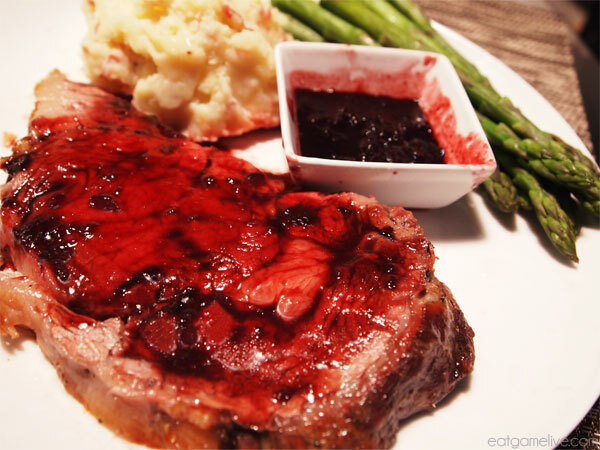 Plate with your sides and serve with your cherry port wine sauce. And here’s the prime rib drenched in the diabolical sauce. MEAT GOOD! 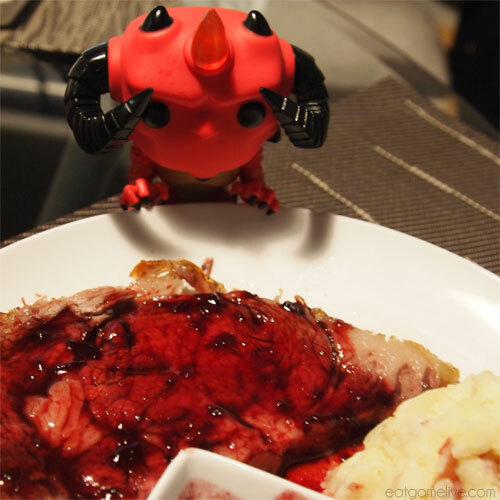 And of course, here’s a shot of Diablo enjoying his own special meal! HOW TASTES YOUR ROAST, NEPHALEM? If you’re looking for a dessert to celebrate Diablo III’s birthday, check out what I made last year: Heart of Sin Cakes! 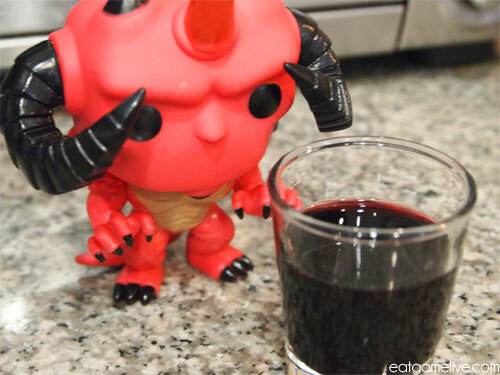 This entry was posted in diablo and tagged diablo, diablo 3, port wine, prime rib by admin. Bookmark the permalink.